It’s been a few times now that I visited Burger Royal. The place is pretty cool, it’s got a laid back atmosphere, and been a Quantin Tarantino fan I like some of the reference they have in the decor and the menu. Naturally the main reason for my visits is the food and I always enjoy a place that can serve a good burger and a shake. SOURCED LOCALLY IN QUEBEC. GRASS-FED. FREE RANGE HORMONE & ANTIBIOTIC FREE BEEF & POULTRY. They have a wide selection of burger but they also serve hot-dogs, Mac N Cheese, Poutine along with other sides and desserts. On my first visit I had to try their burger and I opted for one that I didn’t see after on the menu the BBBLT. They do have some burger specials as well so the offering can change. The BBBLT was excellent, I love bacon so right away it scored major points with my stomach. It was a big burger and even cut in half was a handful. The meat is tender and juicy and all the ingredients were fresh. When you choose your burger you get to pick a 3oz or 6oz patty of beef but you also have a choice of chicken or vegetarian. 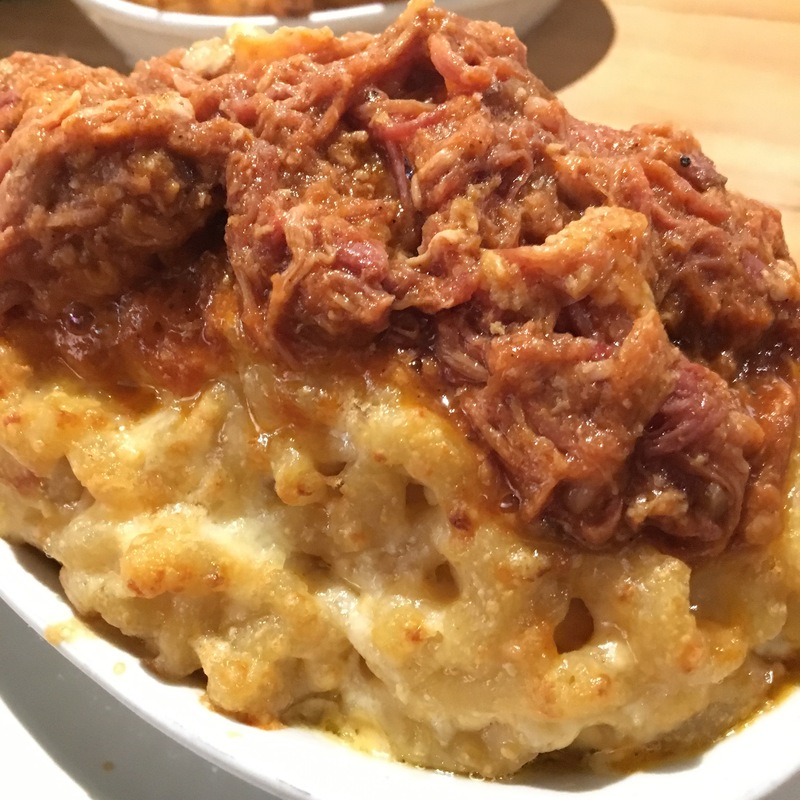 On my second visit I decided to try something different and opted for the pulled pork Mac N’Cheese. When my plate arrived I was a little skeptic as to whether or not I would be full but that thought disappeared quickly after a few bites. The taste was very good and the cheese they use is so rich that it will fill you up quite rapidly. If you’re gonna do the Mac N’Cheese as a side you better be really hungry or might want to share it. You can check out their menu to get an idea of all the choice and option that they have. It does get pretty busy so it would be better to reserve or you can view their website as they also deliver.